The Model II was introduced in May of 1979 and first shipped in October of 1979. The Model II, which included an 8″ drive, sold for $3,450 and was a business computer. Keyboard: 76 Key including Numeric Keypad. Special keys include HOLD, ESCape, BREAK, CTRL, CAPS, REPEAT, Up, Down, Right, Left, F1 and F2. Expansion: Four plug-in card slots for future expansion or converting 32K to 64K. TRS-80 Model II is Radio Shack’s fastest and most powerful microcomputer. It is an extremely efficient business tool that can speed through routine tasks, store vast amounts of data, provide timely information for decisionmaking, and much more-at costs significantly below the industry’s “going price” for comparable computers. All this, yet it is easy to use! Since introduction in mid 1979. Model II systems have brought the benefits of affordable data processing to businesses and professional people everywhere. Its remarkable combination of high power and low cost make it “just right” for countless applications. Even if you own a “maxi” computer, Model II can do many jobs that are “too hot” to wait for shared computer time and those too small for costeffective handling by your mainframe. Radio Shack supports the Model II with a growing line of software and total before-and-after- the-sale service. Our inexpensive user-oriented, well-documented software includes programs for payroll, accounting, inventory control, mailing lists, with more to come. This allows your Model II to go to work quickly with no formal operator training. Model II features easy expandability, compatibilty with external equipment, communications and multi- language programming abilities, as well as low start-up and operating costs. We invite you to investigate the advantages of owning or leasing a TRS-80 Model II system. Why not arrange for a TRS-80 demonstration soon? he basic Model II is contained in one compact, desktop cabinet including a built-in 8″ disk drive for storing Progams and Data. A high-resolution 12″ video display, and a detachable keyboard designed to be similar to the familiar electric typewriter keyboard. It is simple to use. There are as few “special keys” as necessary to do the job. For faster and more accurate numeric input, a calculator-type keypad with . its own ENTER key is provided. Model II’s high-resolution video screen will display 24 lines of 80 upper and lower case characters. Optionally, double-width characters-40 per line-can be selected by your program. Model II is available with either 32K or 64K of Random Access Memory (RAM). This means you can store 32,000 or 64,000 characters of information in the computer’s internal memory. The disk drive provides 416,000 characters of storage for your programs and data on interchangeable “floppy” diskettes. If that’s not enough, just plug in a Model II Disk Expansion Unit with one, two or three more drives. Each added drive stores another 486,000 characters, bringing the total capacity of a four-drive system to about two-million characters. To fill this amount of memorv would require something like 96 hours of non-stop typing at 70 words per minute! Of course, a 32K Model II can be expanded to the full 64K of interhal memory at any time, via our 32K RAM Add-On option. 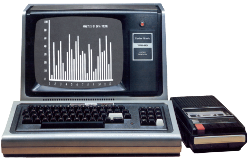 TRS-80 Model II is easily expanded to cope with growing or changing reqmrements. It won’t become obsolete in a few years. Connectors allow you to add printers, plotters, digitizers, communications with data-bases and other computers and a host of options. Internal plug-in card slots are also provided for later options. Model II includes a comprehensive reference manual and a diskette that contains the very powerful Model II Interpretive BASIC language and “TRSDOS” disk operating system. Additional programming languages are also available. withthem, a large number of specialized pre-written software packages in these languages can be used with your Model II, often with little or no modifications. These programs include COBOL, FORTRAN, Compiler BASIC and Editor assembler. Like all TRS-80 computers, Model II is U.L. listed. For value; versatility ease of use, and support, you can’t beat the Model II. It’s all business! All of Model II’s operating software is loaded into Random-Access Memory from the system diskette every time you power-up the computer. So whatever language you choose, it leaves the maximum available user memory No addressable memorv s[ace is committed to Read-Only Memory (ROM). The Model II contains just a small amount of ROMthat merely loads the operating software, then is switched out. TRS-80 Model II BASIC is an easy-to-use, expanded version of our Level II interpretive language. It’s a 17K disk-based interpreter, and features detailed error flagging and quick editing that makes it especially easy to use for program development and debugging. Model II BASIC is an enhanced version of our Level II language. So if you can program in Level II, you’ll find Model II BASIC very familiar, and a bit more versatile and powerful. Command compatibility has heen maintained to the greatest possible extent for the convenience of Model I and III owners who decide to move up to the additional speed and capability of the Model II. And its language does offer quite an improvement for the machine language programmer. TRSDOS (“Triss-Doss”) is a powerful and easy-to-use Disk Operating System that manages Model II’s disk operations. It’s a very comprehensive and powerful operating system for the programmer, yet it is virtually transparet to the non-programmer using pre-written software. Model II TRSDOS provides a full set of library commands and utility programs; and, in addition, many useful system routiens can be called directly by user programs. Some of the 37 Library Commands include: ATTRIB – changes a file’s password. CREAT – preallocates data file space for added execution speed. COPY and MOVE – allow files to be transferred. DEBUG – lets you program, test, and isolate errors in machine language programs. DO – automatic power-up execution of a sequence of commands. FORMS – sets printer page length and width, line width, top of forms, and lets you toggle parallel or serial printer drivers. HELP – asists in clarifying TRSDOS command syntax. PATCH – modifies the code in our system’s software so you can implement updates we provide. RENAME – change sthe name of a file. SPOOL – saves printer output in a disk file for later printing, and also allows printing at the same time other operations are being entered. The Utility Programs are: BACKUP – copes a diskette. FORMAT – organizes a diskette. MEMTEST – checks out RAM. In addition, you have a complete set of communications commands. ECHO – begins echo of keyboard input to display. HOST – allows keyboard input from and video output to a remote terminal. RECEIVE – inputs data into RAM from serial interface. SETCOM – sets RS-232 port paramters. TERMINAL – comprehensive and versatile menu-driven ASCII communications program. Machine language porgrammers can use Supervisor Calls which are Operating System routines. They can be used without worrying about hard address changes which could occur in later software releases. The routines alter certain System functions and conditions; provide file access; perform I/O to the keyboard, video display, and printer; plus perform various computations. TRSDOS also allows keyaheads of up to 80 characters. This means that through buffered storage, you can type in the next command while previous ones are being executed. Model II TRSDOS responds to your commands with positive feedback. If you say “KILL ‘file-name,'” TRSDOS will responde with “‘file-name’ KILLED,” or “‘file-name’ NOT FOUND,” so you’ll always know what was or was not accomplished by your command. And duplicating of a diskette requires knowledge of a master password, which give you additional program and data security. Plus, when an Operating System error occurs, a message appears on the video screen with a numbered error code. And if you don’t remember the particular error, simply type “Error 66,” for example, and Model II will respond with a detailed explanation. TRSDOS comes complete with your Model II. It includes a System Diskette in a deluxe binder, along with a comprehensive user’s guide that documents everything you’ll need to know. Microprocessor: Z-80A 8-bit processor. Clock speed, 4 MHz. Separate keyboard and video processors, direct memory access and vectored interrupts for faster throughput. External Connections: One Centropolis Parallel port, two RS-232C serial ports. Disk Drive: Built-in dual-density 8″floppy, three more available in external unit. Power Requirement: Built-in filtered power supply for 120VAC, 60 Hz. Keyboard: 76-key professional-type including data-entry keypad. Special keys include HOLD, Escape, BREAK, CTRL, CAPS, REPEAT, Up; Down; Right; Left and two programmable special functlon keys. (F1 and F2). Video Display: High-resolution 12-inch monitor with 80 or 40 characters per line, 24 lines, automatic scrolling. Displays upper and lower case characters with descenders. Partial screen scroll protect available. 32 “Business Graphics characters. Internal Expansion: Four plug-in card slots for future expansion or converting 32K RAM to 64K. Overall Dimensions: 14 x 21-1/4 x 23-1/2″. 32K, 1 Disk TRS-80 Model II 26‑4001 $3,450.00 See above. 64K, 1 Disk TRS-80 Model II 26‑4002 $3,899.00 See above. Model II Starter System N/A $4,727.00 An affordable Model II business system for small business applications such as general ledger or accounts receivable. You get 486K bytes of disk storage, including operating system software, and a 64K internal memory (26-4002). The versatile pin-feed 9-1/2 inch-wide Line Printer II (26-1154) prints upper and lower case letters. Also includes Printer Cable (26-4402). This comptuter system is ideal for many businesses, and is ready to be expanded as your company grows and your needs increase. Approximately 416,000 Free Bytes of Disk Storage. Model II “Basic Business” N/A $5,467.00 Here’s the perfect answer to small business inventory control, payroll, and more. Built around the Model II (26-4002) and the Line Printer VI (26-1166) that prints 100 characters per second, upper and lower case letters and special symbols, plus the Printer Cable (26-4401), and the matching System Desk (26-4301) holds the entire system. You can easily expand the memory capacity by adding an optional external disk system when you need it. Approximately 416,000 Free Bytes of Disk Storage. Model II “Word Processing” N/A $6,197.00 You’ll never want to use a typewriter again! Our SCRIPSIT software ($86-4530) and 64K Model II (264002) allow you to compose and edit letters and documents on your video screen, store the text on disk for use or revision at any time, and then print the copy in the format you desire. You can specify automatic page numbering, centering, justification, and more. The Daisy Wheel II Printer (26-1158) gives the finest electric typewriter quality at 43 characters per second. Includes Printer Cable (26-4401). Quality word processing is now available and affordable. 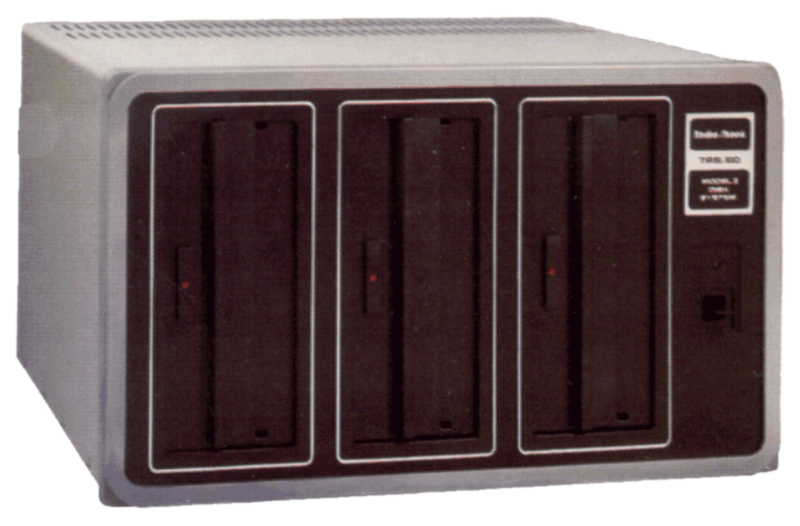 Model II 1.5-Megabyte “Deluxe Business System” N/A $8,017.00 Compare this versatile, hugh-capacity system (1.5-million bytes of disk storage and a 64K internal memory) with systems costing twice as much. We’ve added to the Model II (26-4002), a 2-drive external disk system (26-4161) that gives about 1-million more bytes of on-line storage. The Tractor-Feed Line Printer III (26-1156) is designed for heavy business use. It handles 15-inch wide paper and prints upper and lower case letters at a speedy 120 characters per second, and adjustable line space increments give accurate printing on pre-lined forms such as checks. Also included is the Pnnter Cable (26-4401). And to conveniently hold each item, we’ve included the matching Model II Desk (26-4301). This is a combination iust ideal for larger, integrated accounting systems. Approximately 1,388,000 Free Bytes of Disk Space. Model II 2-Megabyte “Business Management System” N/A $8,766.00 This could easily be the business system! It’s our most powerful Model II combmation, and gives you approximately 2-million bytes of disk storage. Just look at what we’ve teamed with the 64K Model II (26-4002)! A 3-drive external disk system (26-4162) for maximum memory storage. The Line Pnnter III (26-1156) – an excellent business printer. Its bidirectional head prints 9×7 dot-matrix upper and lower case letters at 120 characters per second. And the Printer Stand (26-4302) puts the printer right at your fingertips and frees deskspace. Connection is simple with the Printer Cable (26-4401). Plus there’s plenty of workroom on the System Desk (26-4301). Here’s the system with the versatility, computing power, and speed that you can start with or expand to – whatever your needs. Approximately 1,874,000 Free Bytes Of Disk Storage. Now Radio Shack’s TRS-80 Model II Graphics Option with our new Graphics BASIC language lets you use your Model II’s video display screen as a “sketch pad” for the creation of whatever designs you may need. The result can be sophisticated tables, charts, graphs, illustrations, geometric patterns, maps and more. Your designs will be executed with fine detail, since the screen is composed of 153,600 picture elements, or “pixels”! That’s 640 points horizontally by 240 points vertically. Using the “paint styling” mode you can easily and rapidly fill in broad areas of the screen and you can use a variety of patterns. With the “line styling” mode, you have “point-to-point” graphics options that let you draw any line at any angle with just one BASIC statement! If you already know TRS-80 Model II BASIC, Graphics BASIC will be a snal because you need to learn only eleven new commands! Their power is incredible. For example, by incorporating them into a BASIC program, you can create animation and motion! CIRCLE- Draws a circle, arc, or ellipse. CLS- Clears a character or display screen. GET- Reads the bit-pattern in a block on the display screen into an array for alteration and future use. Used in animation. LINE- Draws a line between points. PAINT- Paints an area in a specified style. POINT-Checks a point for being turned on or off. PRESET – Turns pixel on or off. PUT-Puts contents (bit pattern) of an array onto the screen. Altering these before they are put is part of creating animation. SCREEN – Screen Command/Flash mode. Useful in speeding up the display in painting and motion. Turns graphics screen on or off. VIEW- Defines the coordinates of a specified block (called the “viewport”) on the screen. VIEWPORT- Draws a viewport, which then becomes the current graphics screen. The Graphics BASIC memory board contains 32,000 characters of dedicated memory to store graphics data and is installed on the Model II in an unused slot. Includes user’s manual, 8″ diskette with Graphics BASIC, and subroutine library. 64K Memory Expansion Board 26‑4105 $399.00 Gives your Model II the capacity to generate much larger workssets for the VisiCalc Enhanced program. This memory is not useable by other programs which do not employ special programming techniques required to access it. Installation required (not included). Hard Drive Units Now you can have immediate access to vast amounts of data-almost 9 million characters! With the Radio Shack Hard Disk System, you can set up a powerful data base management system. And you can expand with up to three “secondary” Hard Disk Drives for a total storage capacity of over 33 megabytes. Best of all, most Model II and Model 16 programs will transfer directly to hard disk. 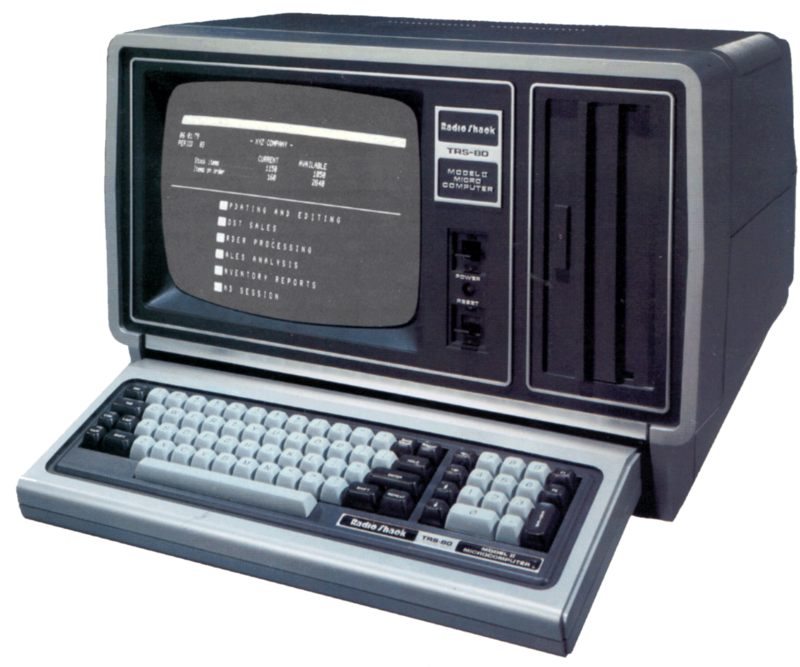 The TRS-80 Hard Disk System is comprised of two 8″ platters, permanently sealed in a dust-free environment. Both surfaces of each platter are accessed by their own read/write head – forming a cylinder of four tracks under the head at any one time. Winchester technology provides reliable, high-speed data transfer. All current TRSDOS library commands are available, plus two new utilities: SAVE and RESTORE. The SAV utility quickly and efficiently saves data from the Hard Disk onto one or more back-up diskettes. You can save all data, a defined list of data, specific file names, or files that have been created or updated since a particular date. RESTORE reads the data on the diskette and writes it back onto the Hard Disk. To best utilize the Hard Disk System, the Global Search sequence on Models II and 16 will examine the hard disks first, then the floppy disks. Expand the storage capability of your Model II or Model 16 with our incredible Hard Disk System. Installation required. Specifications: A 2-platter, 4 surface, 8″ disk drive employing sealed media with a self-contained, reciculating filtered air system. Formatted Capacity: Primary drive – 8.6 megabytes, secondary drives – 8.9 megabytes. Disk Format: Each of the 4 disk surfaces has one movable read/write head to access 256 data tracks on that surface. A 4-track cylinder is accessible under all 4 heads with a single seek. Disk Size: Two non-removable 8″ disks. Data Transfer Rate: 4.34 megabits/second. Disk Rotation Speed: 3125 RPM. Track Access Time: 19 milliseconds (track-to-track). Dimensions: 5-1/2 x 18-1/2 x 19-1/4″. Power: 120VAC, 60 Hz, 140W. U.L. listed. Secondary Hard Disk Unit 26‑4151 $3,495.00 Good news for 8.4-Megabyte Hard Disk owners! Now set up a powerful system at a very affordable price. Add up to three secondary drives for over 33 million characters of storage. Secondary Hard Disk is compatible with Model II, 12and 16 software. (Note: Not for use with our 12 or 15 megabyte hard disk drives). $1,995.00[RSC-14] Get reliable, extremety fast access to 15 million characters of data. Ideal for accounting, inventory and data base management applications. Compatitibe with our multi-user and single-user operating systems so most programs transfer directly to hard disk. Expand with three secondary drives for 60 megabytes of storage. (Not compatible with our 8-megabyte hard disk.) Requires cable kit, installation (not included). A 3-platter, 6-surface, 5-1/4″ disk drive. Self contained, recirculating filtered air system. Formatted Capacity: Primary – 14.6 megabytes, Secondary – 15 megabytes. Disk Format: One movable head accesses 306 tracks per disk surface. Data Transfer Rate: 5 megabits/second. Disk Rotation Speed: 3600 RPM. Latency: 8.3 ms (average). Track Access Time: 3 ms (track-to-track). Dimensions: 5-1/2 x 14 x 15″. Power: 120 VAC, 60 Hz. U.L listed. $1,495.00[RSC-14] Requires installation (not included). 35 Megabyte Hard Disk Drive (Primary) 26-4171 $2995.00 [RSC-14] Get reliable, extremety fast access to 35 million characters of data. Compatible with MS-DOS or XENIX multi-user systems only. Can be used with our 12 and 15-megabyte drives. Not compatible with our 8-megabyte hard disk. Expand with three secondary drives. Requires cable kit, installation (not included). 35 Megabyte Hard Disk Drive (Secondary) 26-4172 $2695.00 [RSC-14] Requires installation (not included). $349.00 [RSC-14] Requires installation (not included). Hard Disk Air Filters 26-1363 $0.99 [RSC-14] Package of 3. Disk Expansion Units Expanding the disk storage of your TRS-80 Model II system is as easy as plugging in one of our external Disk Expansion Units – available with one, two, or three drives. Each individual drive adds about 486,000 bytes of on-line storage. And, if you buy a one or two drive system now, you can add Disk Drive Kits at any time to expand to a two or three-drive system. Specifications: No. of Drives: 1 to 3. Disk Format: Track 0, System information; tracks 1 through 76; 26 sectors, 256 bytes per sector (double density). Disk Size: Standard 8″ diskette. Data Transfer Rate: Double density, 500 kilobytes per second. Disk Speed: 360 RPM. Latency: 83 mS average. Track Access Time: 260 mS average; 10 mS track-to-track. Power: 120VAC, 60 Hz, 150 watts. U.L. listed. Size: 11-1/2 x 18-1/2 x 21″. Disk Drive Kit 26‑4163 $600.00 Includes disk drive only. Lever, no light. Disk Drive Kit 26‑4164 $600.00 For 26-4160/26-4161 where first drive has lighted bar. Universal 8″ Disk Drive Head Cleaning Kit 26‑4957 $14.95 Cleans drive heads safely and easily. Just apply special solution to cleaning diskette and run in drive for 30 seconds. 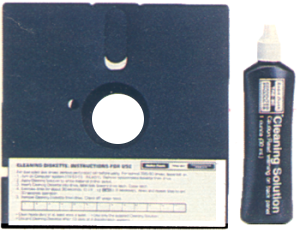 With cleaning diskette, solution and instructions. Model II System Cover 26‑4051 $9.95 Add a professional touch and help keep your investment looking and performing like new. Durable one-piece cover with stitched edges fits the Model II keyboard and display. Blank 8″ Diskette 26‑4905 $7.50 Radio Shack’s blank 8″ diskettes are perfect for use with the Model II Disk System. These diskettes have been custom-manufactured to assure 100% compatibility and to meet our high quality control standards. Each is individually tested to insure reliability and certified against defects. Disk Envelopes 26‑4907 $7.95 Package of 10 clear plastic sleeves that protect 8″ Diskettes. Punched for standard 3-ring binders. Blank Disk Labels 26‑4908 $1.95 Package of 50. Model II Technical Manual 26‑4921 $29.95 Includes theory of operation for the CPU module, FDC, video/keyboard, video display, disk drives, and the power supplies. General checkout procedures aid in tracing problems to a specific sub-assembly. 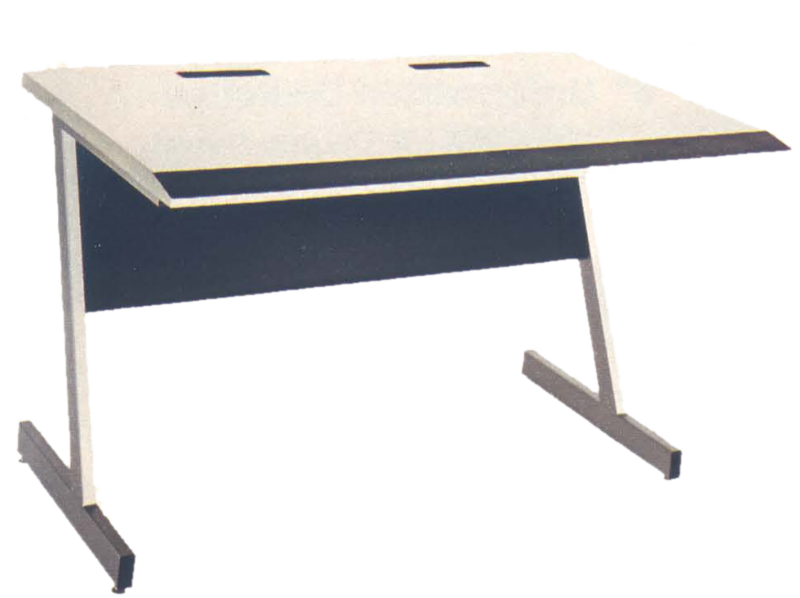 Model II System Desk 26‑4301 $369.00 Matches the TRS-80 Model II. Large drawer with center divider stores diskettes, and mounts on the right or left. mount drawer low and place Disk Expansion Unit above it. Heavy-duty metal construction with wiring cut-outs. 28 x 48 x 29″. 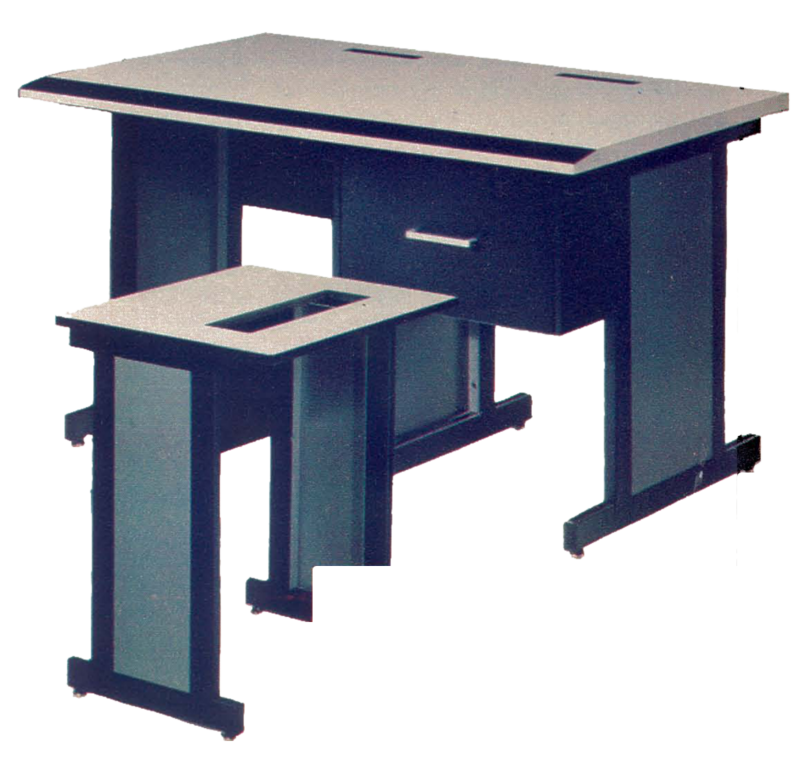 Model II Printer Stand 26‑4302 $149.00 An ideal match to the System Desk. Slotted top allows use with just about any line printer, and permits bottom paper feed. 27 x 23-1/2 x 19″. Model 16 Enhancement Option 26‑6010 $1,499.00 Good News for Model II Owners! Get a 16 Bit Microprocessor and and Up to 256K Memory! Now you can have the advantages of our latest microcomputer technology. This Enhancement Option includes installation of two boards: one containing the MC68000 16-bit microprocessor and a 128 thousand character memory board which can be upgraded to 256K. That’s one-quarter-million characters of on-line memory directly available for use by the MC68000. Your Model II will be just like a Model 16, but using your existing disk drive, and having a maximum of 256K internal memory. Compatible With Model II Software! Your system is still a “full-function” Model II, and you can use all of your present Model II software without modification. You may also use the software Radio Shack is developing to take advantage of the MC68000’s 16-bit processing power. With the Enhancement Option your Model II will actually contain two microprocessors because the Z-80A processor and its support circuits are retained for Input/Output. This frees the 16-bit procesor to bring its full powert to bear upon data processing problems and memory management functions. By mid-1982, your enhanced Model II, operating as a Model 16, will be able to support three users simultaneously! Thus two workstations in your office can be low-cost remote terminals like our new DT-1’s. It’s like having three computers in your office at a much lower price! Arcnet Local Area Network Arcnet Local Area Network. Radio Shack’s Arcnet (or Attached Resource Computer Network) is the high-performance local area network for TRS-80 computers. peripherals, software and information. With Arcnet, you can link up to 255 Model 12 and II computers for effective, large-scale operations. Office personnel can share hard disk files, printers and other accessories-and gain all he advantages of up-to-the-minute red information! And Arcnet is highly , Me. because it’s based on Datapoint Corporation’s customer-proven ARC local network technology. How Arcnet Can Work for You. Let’s say you’re maintaining customer, sales and inventory records on a TRS-80 computer with printer and hard disk, and several sakes or managerial people need fast access to up-to-the-minute status. Up to 255 TRS-80’s can be tied into an Arcnet system to utilize the same disk files and even the same printer. But in addition to sharing files, each user now has the benefit of his or her own computer system (including space on the hard disk for files), so other functions can be performed-electronic filing, word processing and so on. And all files on the hard disk me available to any user. Confidential files can, of course, be restricted. In this Arcnet system, you can increase your processing ability significantly without the cost of printers or hard disks for each additional user – and without any reprogramming. You can continue adding TRS-80s to the network in affordable steps – and with out downtime – to meet the needs of your growing business. This system could easily tie into an administrative office word processing system where five workstations are sharing the resources of two printers. Your entire company now has a common database accessible to all users! Expand to the Power You Need. The smallest practical Arcnet system consists of three computers. Two workstations – called applications processors – can be connected to share the large hard disk file of the third TRS-80 – known as a file processor. As you exceed the capacity of this three-computer network simply plug in another applications or file procesor. Arcnet consists of three hardware components. First, the Arcnet board is needed in each computer – it installs in an existing card slot in the rear of the TRS-80 Model 12. When using a Model II, you will also need a 16K Z-80 Memory Expansion Board if the Model II has not been used with a hard disk. The second element is the Coaxial Cable. One end is plugged into the computer, the other end goes to the third component, the “Hub”. Arcnet Board 26-6501 $399.00 Includes Applications Processor software and user’s guide. Installation required (not included). Arcnet File Processor Software 26-6502 $499.00 Includes software, operation manual and system manager’s manual. Only one package required per system. 16KB Z-80 Memory Expansion Board 26-4503 $189.00 For Model II previously not used with hard disk. Active Hub 26-4508 $995.00 Connects up to seven Applications Processors to one File Processor. Total cable length between a computer or Active Hub and any other computer or Active Hub can extend up to 2000 feet. Active hubs can be linked for a system spread of up to four miles. U.L. listed. Arcnet RG62 Coaxial Cable The Arcnet RG62 coaxial cable is an ideal medium for the high-speed transfer of data. It interconnects the Applications Processors, Hubs and File Processors. All cable features a braided copper shield and a solid copper center conductor. Choose from complete assemblies with industry-standard BNC connectors. Cable is also available by the foot. Arcnet RG62 Coaxial Cable (Bulk) 26-6513 $2.29 per foot. Arcnet RG62 Coaxial Cable (BNC/BNC Coupler) 278-115 $3.29 Allows connection of cable assemblies. SIGI Career Guidance Program 26-2699 1,200 A computer-basad System of Interactive Guidance and Information from the Educational Testing Services designed to help college students make career decisions. 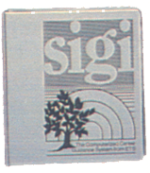 SIGI blends an approach to career guidance that emphasizes individual values, a vast store of occupational data, and an effective strategy for processing this infomration. It provides a clearly defined structure for decision-making by students, but responds flexibly to individual needs and circumstances. Develops students’ understanding of the elements in volved in making career decisions. Requires Model II or Model 12 or 16 (in Model II mode) and two disk drives. Student Information System 26-2729 $249.00 Lets you collect, organize, retrieve and print information on the student population of your school. Construct a list of student profiles – each profile includes basic information on the student, plus your choice of information unique to your needs. Construct special lists from your information categories and print reports, mailing labels, folder labels, and more. Records can be updated at any time. Attendance System 26-2730 $330.00 Helps you keep track of attendance for those students whose names have been entered into the Student information System. The teacher records absences on special cards, which are later read by the CR-510 Card Reader. Takes attendance on a period-by-period or daily basis and calculates monthly attendance statistics. Attendance Cards 26-2741 $24.95 Package of 500. Class Roster Forms 26-2744 $19.95 Package of 500. Individual Scheduling System $26-2732 290.00 Help you plan your master schedule, schedule students, produce schedule cards, and continue to change individual student schedules during the term whenever necessary. Grade Reporting System $26-2731 380.00 Grades for each class roster can be recorded on machine-readable cards, then printed on report cards. Each student’s report can include academic marks, a citizenship mark, absences, and the number of credits earned in the course. Includes up to three “teacher’s comments” chosen from a list of 36 comments the faculty can write themselves. Report Card Forms $26-2745 9.95 Package of 500. Up to 500 accounts and 6000 transactions/month. Ten categories of income and expense accounts. DR/CR or +/- terminology usable throughout. Sessions may be edited up to time of posting. Requires 64K, 1-Disk System. The Model II General Ledger program can produce professional Balance Sheets and Profit and Loss Statements at a moment’s notice. User-defined chart of up to 504 accounts, user-defined 4-digit account numbers. Automatic “out-of-balance” detection, entry totaling and document balancing. Seven optional expense categories. Prints totals up to $99,999,999.99 with 16 digit accuracy. Up to 50 entries per document (up to 3072 documents per month). Up to 11,420 entries per month. Automatic well-defined audit trails. Controlled inputs for error prevention and rapid entries. Visually-oriented editing. Easy document correction and error recovery Reports generated include: Chart of Accounts, Trial Balance. Document List, Posting Summaries, Ledger Detail Report, Income Statement, and Balance. Inventory Control System 26-4502 $199.00 Take stock of your business quickly and easily! Inventory control is an important priority for every company that has to maintain an investment budget, yet meet its consumer demand. Achieving the proper balance requires information about the flow of merchandise through an inventory, and prudent decision making concerning that flow. When used as a management tool, Inventory Management System (IMS) can help make consistent and efficient inventory a reality for your company. It handles up to 3000 inventory line items, 200 vendors, on-hand quantities up to 999,999 with a maximum selling price of any item at $9999.99. IMS goes beyond most “traditional” inventory systems by projecting your reorder needs based on analysis of past performance and sales trends. You can also analyze your stock turnover and calcualte the gross margin for each stock item. Reports generated include: Master Inventory List, Vendor Listing, Transaction Posting Report, Suggested Order List, ABC Code Analysis, Physical Inventory Worksheets, Physical Inventory Error Report and an Inventory Performance Repot, which includes a Total Inventory Perforamnce Report, which includes a Total Inventory Performance Symmary, ABC Code Performance Symmary and ABC Code History Summary. Our Inventory Management System interfaces with General Ledger program. Up to 500 employees. State tax tables, city tax automatically calculated. Nine earnings, 9 deductions categories. Prints checks and W-2s. Check register, payroll journal, end-of-period reports available. Requires 64K, 1-Disk System. A complete small-business payroll system that calculates and prints checks automatically calculates state tax in any state or the District of Columbia and one city withholding tax as a percent of gross wages or federal tax. Calculates earnedincome credit payments. Prints W-2 forms at the end of the year. Nine user-defined earnings categories, nine user-defined deduction categories, and seven user-defined workman’s compensation classifications. Handles up to 200 employees. Provision for automatic voluntary deductions, such as Savings, Christmas Clubs, etc. Prints check register before or after printing. Automatic monthly, quarterly and annual journals. Automatic out-of-balance deterction. Easy error correction and recovery. Optional time card calculations with automatic overtime. Multi-drive update to General Ledger. Main menu shows four categories for selection with a summary of each. Accounts Receivable 26-4504 $299.00 Adds and maintains up to 2000 accounts. Sales and payments are easily entered. Printouts of General Ledger journal entries and complete reports are available at any time. Also prints monthly billing statements for mailing. Requires 64K, 1-Disk System. The Radio Shack Accounts Receivable package is designed as a complete invoicing and monthly statement generating system which keeps track of current and aged accounts receivable. Interactive, menu-driven programms. Self-instructing user documentation. Allows “open item” and “balance forward” accounts. Special consolidation feature for greater capacity. Prints statements and invoices. Automatic customer billing option. Both Summary Aging and Detail Aging reports: Sample data in manual for training. Flexible open credit reconciliation procedures. Selectable record capacities. Add additional drives for increased quantities and automatic update of General Ledger. Accounts Payable 26-4505 $199.95 The APS will print checks, cash requirements, aging reports and totals for posting to vour company’s General Ledger. The APS will help you decide when to write your checks for maximum discount, and how those checks affect your cash position. Compatible with either Cash or Accrual Accounting methods. Up to 500 vendor accounts and 300 invoices on file on any one time. Easy maintenance of accounts. Invoice Selection function gives broad flexibility of operation. Reports include: General Ledger Codes, Vendor Listing. Invoice Listing, Posting Report (with GL totals), General Ledger Recap, Cash Requirements, Aging Status, Check Preview. Check Register, Discount Lost Report. GL Totals after Check Printing, End of Period Processing (with GL totals) and Year End Report. Mailing List 26-4506 79.00 3000 names in expanded format, 4000 names in compressed format. Screening and selection on any criterion. Ideal for subscription services and customer lists. Variable spacing and formatting – prints multiple lables across and oversized labels with return address. Requires 64K, 1-Disk System. Designed to make the secretary’s life much easier. This program stores names and addresses, available for update at any time. Each name may also be assigned up to eight special categories. Any number of names may be selected through the computer and printed for future use. Finally, the program will print the selected address labels. Automatically puts records in alphabetical and Zip Code order. Rapid access to any name on the list. Easy error correction. Prints listings and address labels. Revise or update any information at any time. Expanded or Compressed files: with compressed format you can store up to 3000 names, with expanded format you can store up to 2000 names with additional “comment line.” 5 different label sizes with as many as 5 labels across a page. Mailing List-II System 26-4507 $119.00 Designed to make the secretary’s life much easier. Stores names and addresses, which can be revised or updated at any time. Each name may also be assigned up to eight special categories. Any number of names may be selected and printed for future use. The system also will print the selected address labels. Automatically puts the records in alphabetical and Zip Code order. Rapid access to any name on the list. Compressed format stores up to 3000 names. Expanded format stores up to 2000 names with an additional COMMENT line. Five different label sizes with as many as 5 labels across a page. Names and addresses can be MERGED with our SCRIPSIT word processor (26-4530) for perfect form letters (requires a second disk drive). Medical Office System 26-4508 $750.00 A complete patient and record-keeping system for up to 10 physicians. Handles up to 3000 accounts and 9000 transactions per month. 450 procedures and diagnoses, 4 recall medications, 2 recall dates, and 2 insurance companies per patient. Produces monthly statements, insurance forms, daily recap, transaction review, aged accounts receivable, procedure and diagnosis reports. Requires a minimum of 1 External Disk Drive. Customized letters and mailing labels using Profile II (26-4512) and SCRIPSIT (26-4531) and extra external disk drive. Manufacturing Inventory System 26-4509 $750.00 A four module program that lets you review inventory, establish a cycle counting procedure, process inventory transactions, describe parts and quantities required to produce finished goods, determine the status and dollar value of orders, track work in progress, determine estimated vs. actual product cost, project order completion dates, plus labor and material requirements, and more. Requires 2 External Disk Drives. Review inventory, establsh a cycle counting procedure, process inventory transactions, describe parts and quantities required to produce finished goods, determine the status and dollar value of orders, track work in progress, estimate order completion dates, labor and material requirements, and more. Installed in four stages. First, Inventory holds up to 2100 items and can function as an independent inventory systern. Second, Bill of Materials holds up to 600 bills with up to 99 components each. Third, Order Entry and Movement allows entry of up to 200 manufacturing orders and moves them through all phases of production. Fourth, Planning helps with labor scheduling, projects material requirements, and order completion dates. Requires 2 external disk drives. Versafile 26-4510 $69.00 Versafile is a program that lets you create your own computerized filing system. It can be used for any purpose, business or private. You decide what goes in your files and how. The computer does the rest. The easy methods used by the system let you store and retrieve almost anything, from a used car inventory to an insurance agent’s client information. The computer picks “key words” out of typed statements and stores them in corresponding files, ready for easy retrieval. All you have to do is type a question containing the same key words. Versafile will then retrieve any statement contaning the combination of words you request. Global search function locates any word or phrase. Prints selected or complete files. Will expand to use 4 drives. Visicalc 26-4511 $299.00 A professional planning and management tool that lets you perform “What If. . .” calculations quickly and easily The screen becomes an “electronic spread sheet” that allows you to set up your own particular application – with headings, formulas, and data. As new data is entered, VisiCalc will recalculate and display the updated figures for the entire spread sheet. Editing features let you change, insert or delete titles, formulas, or data. Formatting commands let you design your own charts and tables. Designed for the decision-maker. VisiCalc is an amazingly efficient management planning tool that can be used for everything from corporate finances to engineering work and family budgets. Computer experience is not required. With VisiCalc, the TRS-80 screen becomes a window through which you view a section of an electronic “worksheet” organized in columns and rows. In each “entry position” you can insert a description, number or formula VisiCalc goes to work when you alter a number previously “written” on your worksheet-the related numbers change before your eyes as the program instantly recalculates every affected item! For example, you can enter the projected cost of a new employee into a VisiCalc worksheet containing current and projected profit and loss figures. VisiCalc will then recalculate every related figure to show the effect of your addition. Quick “What if . . .” studies like this can give you an effective way to predict the results of important decisions. What might take hours with pencil, eraser, calculator and columnar pad is performed In seconds with VisiCalc! Editing is easy and there are built-in math functions for speedy solutions to complex englneering problems. You can also produce simple graphs, and of course save your “worksheets” on disk for future use. Requires one-disk 64K TRS-80 Model II. For printed copies of your worksheets you can add a TRS-80 Line Printer. Profile II 26-4512 $179.00 Profile II is a filing system that is designed to make the largest amount of information available at the touch of a key (word or number). It is a fast, accurate system that allows up to 20,000 individual records to be stored, reviewed or updated at the touch of the keyboard. Profile II can keep track of names and addresses, accounts. bills owed and paid, personnel records and countless other files and records. Unlike a conventional file, whch can be searched in order only (such as alphabetically or by account number, but not both) Profile II files can be searched by up to 36 user-defined criteria. Quick and easy access to individual records, or groups of records. Information field types include alpha numeric, numeric, decimal, protected, add, and subtract. Up to 99 categories in a single record. Up to five screen formats for each file. Prints up to five different user-defined reports for each file. Reports can include automatic page numbering and use of the current date. Prints up to five user-defined labels for each file. Multiple earch keys allow numerous label and report selections within each format. Each format contains user-defined fields that can be selectively protected. Multi-parameter sort, multi-key search. Stores up to 3000 single segment records on a single drive, up to 20,000 with extra drives. 1800 multi-segment records when using extra drives. Easy access to files by Model II Scripsit for letters and reports (must have more than one drive). Full Print Formatting featuring a movable 132-column window that lets you design the form you want for your printouts. limited Menu capability gives access to files without allowing fil structure manipulation. One of our most popular programs-an electronic filing system that can search through your records to find just the files you want – In seconds! Keep track of names and addresses, accounts, bills owed and paid, personnel or customer records and more. You specify the way your files are set up and how information appears on the screen and prinied reports. Profile II even includes options that restrict unauthorized users from accessing confidential files. Store up to 99 data fields in a slngle record. and, print up to five different reports for each flle. Reports can include automatic page numbers, current date and column totals. With two or more disk drives, Profile II can merge with SCRIPSIT to provide names, addresses and other data to be included in your letters and reports. Stores up to 3000 records with a one-disk 64K Model II system, up to 20,000 with external disk drives. Job Costing 26-4513 $149.00 Enables small construction companies to accurately track the progress and cost of each job. Expenses are entered as they are incurred and are posted to each task by cost category. Detailed and summary information is available on each job. As jobs are completed, year-todate profit and loss is maintained on disk for one year. Order Entry with Inventory Control 26-4514 $199.00 A unique package that will interface with and become a vital part of the Model II Accounts Receivable program. The program defuces duplication of efforts, and saves time in filing orders, producing invoices and posting sales and adjustments to each customer account. Designed primarily for non-manufacturign distributors that maintain up to 650 accounts in accounts receivable and up to 2000 items in inventory. Requires 4 disk drives and a 15-inc wide printer such as TRS-80 Line Printer V.
Profile Plus 26-4515 $299.00 An expanded version of Profile II with a number of sensational “extras.” Allows arithmetic operations up to 16 equations of 63 characters each-and lets you switch between any of your five screens. Create customized menus. Index your file in logical order for high speed access to records. Selectable record lengths prevent wasted disk space and increase the maximum number of multi-segment records. Profile Training 26-4516 $69.00 Gives you a working knowledge of the endless capabiltles of Profile II by taking you through a carefully sequenced, step-by-step learning experience Four audio cassettes wlth an excellent 96-page manual. This informative package gives you a working knowledge of the endless capabilities of Profile II. You are guided through a carefully sequenced, step-by-step learning experience. Examples are provided to demonstrate the flexability of the Profile software. Provides an excellent learning foundation for Profile Plus users, too. Four audio cassettes with an excellent 96-page manual and training disk. Profile Upgrade 26-4517 $120.00 For owners of Profile II. Adds all of the features of Profile Plus. Time Accounting 26-4520 $499.00 Detailed time analysis of jobs performed by up to 14 professionals. A must when exact billing information is needed. Handles up to 1000 clients, 500 jobs, 4500 transactions, and 99 charge code categories. Tracks billable and non-billable time, cost of each individual’s time, billable and non-billable expenses, amounts billed, amounts paid, and more. Requires 3 External Disk Drives. VisiCalc Enhanced 26-4521 $299.00 Designed for the decision-maker, the new VisiCalc is an amaingly efficient management planning tool that can be used for everything from corporate finances to engineering work to sales projections. Computer experience is not required. With VisiCalc, the TRS-80 screen becomes a window through which you view a section of an electronic “worksheet” organized in columns and rows. In each “entry position” you can insert a description, number or formula. VisiCalc goes to work when you alter a number previously “written” on your worksheet-the related numbers change before your eye as the program instantly recalculates every affected item! For example, you can enter the projected cost of a new employee into a VisiCalc worksheet containing the current and projected profit and loss figures. VisiCalc will then recalculate every related figure to show the effect of your addition. Quick “what if …” studies like this can give you an effective way to predict the results of important decisions. What might take hours with pencil, eraser, calculator and columnar pad is performed in seconds with VisiCalc! The new entry editor speeds worksheet preparation by allowing you to modify formulas and labels without re-entering them. And new logical and comparison operators let you perform testing and branching. Built-in math functions permit speedy solutions to complex engineering problems. You can also produce simple graphs, and of course save your model on disk for future use. Add a printer and ou can print your entire worksheet, or any portion of it. With an additional 64K memory board, you can produce even larger worksheets. (Memory board is not required for owners of Model 16 computers or Model II computers equipped with Model 16 upgrade). Avail. 10/30/82. VisiCalc Business Forecasting Model 26-4526 $99.00 Allows you to generate financial reports based on your VisiCalc spreadsheets. Features pre-formatted templates for income statement, balance sheet, cash flow and financial ratios. Three supporting templates-sales and cost of goods sold, salaries, and assets and depreciation – are provided for inputting data to the four financial reports. Data is transferred from one template to another using the VisiCalc DIF format. Techniques and suggestions for modifying the templates for your own business forecasting needs are included. 26-4831 $399.00 The latest version of our powerful word processing system for the TRS-80 Model II will speed up any job you are doing now on a typewriter. It’s easy to learn and use, with “plain English” prompts and menus that put advanced editing capabilities at our fingertips! Since SCRIPSIT will display up to 22 lines of up to 80 characters on – – the TRS80 screen, it’s much easier to use than “smart” typewriters that give you only a one-line display. Letters, reports and manuscripts can be written and edited right on the display screen. Then, with an optional printer, you can print as many “letter perfect” copies as you want, at an incredible 500-plus words per minute. Frequently used reports, forms or paragraphs can be stored for use again and again – and updated at any time. SCRIPSIT has many “extra” features including automatic block moving and duplications. Easy page numbering and renumbering, plus an information line that keeps track of cursor positioning, margins, line spacing and page number. SCRIPSIT’S Global Search mode will locate a specific word wherever it occurs in your text for selective editing. Floating format and reverse indentation make it easy to set up tables and special formats. You can define up to 20 keys for individualized use-to reprint words and phrases or to access special functions. You can also store up to 11 formats that you use often and select the one you want with just a few keystrokes-a real timesaver for the busy typist. SCRlPSlT offers full headers and footers, as well as underlining, subscripts, superscripts and boldface, depending on the prtnter you choose. Allows loading and storing of ACSll text files. Stores up to 320,000 characters on each diskette wtth a one-disk Model II system-plus up to 400,000 characters on each external drive you add to your Model 11 system. SCRIPSIT’s “background” feature even lets you print one document while you’re typing or editing a different one. Add a second drive to use the SCRIPSIT Spelling and Hyphenation Dictionary-and you can even “merge” names, addresses and information from our Mailing List II or Profile II (electronic filing) programs for fast, automatic printout of form-type letters. Includes a superb manual as well as a self-paced trainin course on audio cassette tape. Requires 64K TRS-80 Model II. SCRIPSIT Utilities 26-4532 $129.00 This enhancement allows you to move columns of text and numbers quickly and easily, as well as provide totals, subtotals and averages of numerical columns directly from SCRIPSIT You can also copy often used standard paragraphs stored in a special “boilerplate” utility without having to leave the document you’re currently working on. A communications utility lets you transmit and receive documents to or from another Model II or 12 SCRIPSIT system by phone (requires modem) or directly using an RS-232C cable and a null modem adapter. SCRIPSIT Dictionary 26-4534 $199.00 Automatical “proofreading” for SCRIPSIT! Contains over 100,000 words, abbreviations, proper names, contractions and foreign words with hyphenation points. Checks and displays your text on the screen with misspelled words highlighted. You can add up to 2000 words that are used in your environment: medical, legal, engineering. scientific terms, etc. Requires SCRIPSIT 2, and one external disk drive. 26-4834 $199.00 This automatic “proofreader” for SCRIPSIT checks and displays our text on the screen, highlighting misspelled words. Contains over 100,000 words, abbreviations, proper names, contractions and foreign words with hyphenation points. You can add up to 2000 words that are used in your profession – medical, legal, engineering, scientific terms, etc. Requires SCRIPSIT 2.0 and one additional disk drive. SCRIPSIT Plotter Driver 26-4536 $49.00 Now you can add a vivid dimension of clarity to your text and overhead projector transparencies. This program lets you use SCRIPSIT 2.0 to output to our TRS-80 Multi-Pen Plotter. Print nine character sizes in six colors-red, black, blue, green, violet and orange. Draw boxes around your text, straight lines, underlines, superscripts and subscripts. Simple commands let you easily change character sets, set character size, and switch color pens. Use either a vertical or horizontal format. You can also move one-half space in any direction, or move backward a full space. Supports all plotter text-oriented features, plus character and word-incremental justification. Requires SCRIPSIT 2.0 and TRS-80 Multi-Pen Plotter. Avail. 10/30/82. Statistical Analysis 26-4540 $99.00 A menu-oriented data analysis system. Programs for descriptive statistics, graphic histogram, frequency distribution, one and two-way analysis of variance, one-way analysis of covariance, correlation matrix, chi-square analysis, time series analysis, multiple regression, random data samples, and item analysis and test/survey scoring. Data may be entered from the keyboard or from data files stored on disk. An interactive utility program makes it easy to prepare, update, list, and print your data files. Each program provides the option of printing the results on a line printer. Includes step-by-step instruction manual. Litigation Support 26-4545 $.00 A versatile filing system for the attorney. Enter client’s back round, case history, and correspondence. 8 tore up to 350 client records, 12 pleas, 10 memos. Program doubles as a paralegal. Type in a subject, topic, case number or keyword, and matching records are displayed. Store up to 575 records, 144 spaces for sources, 255 spaces for description. Complete report generation. Compose letters and reports using SCRIPSIT (26-4531) and extra disk drives. Business Graphics Pak 26-4550 $249.00 Graphics Make Dull Data Come Alive. Give your reports the graphics advantage with our Business Graphics Analysis Pak! It tets you get your point across-reveal trends. make comparisons clearer and show patterns that may be hidden in columns of figures. Easy Data Manipulation. Just enter your data – the program then generates your chart. Choose from pie, bar, line or scatter charts. Your graph is immediately displayed on the video screen for editing. The program will develop settings and labels for your charts-or you can tailor them yourself. Entry, editing and format settings are a breeze because they’re “menu driven.” New data can be added or values changed and the new chart viewed again before printing. You can even perform simple arithmetic or complex trend, growth, moving average, consolidation or logarithmic operations. Produce Professional Graphs Quickly. Enter data from the keyboard or from disk files including the VisiCalc planning program. Choose line type, shading, stacked or grouped bars and a frame with just a few keystrokes. Produce charts on selected Radio Shack printers or multi-pen plotter. Accounts Receivable, Series I 26-4554 $199.00 A smaller, yet reliable system that features customer file maintenance, customer actiwty query, invoice generation, transaction editing and open credit reconciliation. Reports generated include Aging, Transaction, Customer Account, and of course statements. End-of-Period processing. File verification. 1700 entries (accounts plus transaction). Menu Generator 26-4555 $39.00 Now you can create custom menus in machine code for BASIC or COBOL programs – or special individual applications. It’s perfect for the Model II Hard Disk owner who has numerous applications on line at one time. You can create a “master” program menu, or even a menu of menus. A single key can be set up for a series of TRSDOS commands. You indicate the key to be pressed, the prompt you want to see in the menu, and the command line you want executed. Allows 12 selection items per menu. Available 10/31/82. Profile Forms 26-4556 $125.00 This new enhancement program for Profile Plus lets you print one detailed record per sheet on each item in your file, rather than Profile’s normal one or two line listing on muhikitem reports. Each form can be up to 132 characters wide and up to 66 lines deep. Up to five different formats per file can be maintained. Supports 1/2″ line feed and special characters (depending on printer used). Intermix text and Profile data. Available 10/30/82. Profile Archive 26-4557 $49.00 A practical program that lets you purge inactive records from any file in Profile Plus. Deletions can be performed based on up to 16 criteria. You have the option of listing the deleted records to a line printer and/or merging them into a separate archive-or history-file. Available 10/30/82. Profile Prosort 26-4558 $149.00 High-speed indexing program for Profile Plus that allows you to sort and select records from any one segment of a file at a time. You can sort on one field with sub-sorts on four additional fields, ascending or decending. Select records using up to 16 selection criteria. Also allows you to print your records using a previously created disk index. You can create up to five indexes for reports and one index for video inquiry. Available 10/30/82. Profile Lookup 26-4559 $199.00 Turns Profile Flus into an automatically cross-referenced system. Lets you enter or extract data in up to five different data bases at once, and writes it into records, reports, forms and labels. Westlaw 26-4560 $249.00 This package (and registration with the WESTLAW system) gives you access to WESTLAW’S powerful “electronic” legal research library. This interactive system lets you enter words relevant to your case. WESTLAW searches among synopses, headnotes, and the full text of opinions for a similar case. You also have access to West’s Topic and Key Numbers, Shepard’s Citations, West’s Bankruptcy Reporter, federal court decisions, federal tax files, and the United States Code. Requires 1200-baud modem. Multiplan 26-4580 $249.00 A truly sophisticated, yet incredibly easy-to-use decision support tool. Multiplan lets you consolidate related worksheets so that information is transferred between them automatically. For example. your company’s sales forecast can be updated automaticaly whenever you change the data in any worksheet containing your regional sales figures. “Plain English” Convenience. All prompts are full length words or phrases. Plain English names can be assigned to any column, cell or area, so that formulas can be expressed as “Gross Profit = Sales – Cost.” If you have any questions, an On-Line Rference Guide gives you instant help – it knows where you are in Multiplan and offers information related to your problem, right on the screen. Advanced Features. With Multiplan, up to eight display windows can be created on the screen simultaneously. Sorting can be performed in alphabetical or numerical order. Cells can be set up individually, by row, column, block – or globally. Cell entries can be left or right justified, and can display values in graph form or as integers. You can vary individual column widths, center numbers and text within a column and align decimals. Format reports with user-selected top, bottom, and side margins, row and columnn numbers and more. Multiplan can directly utilize your current VisiCalc files, too. Includes tutorial manual. Personnel Search 26-4621 $299.00 Helps match employers with potential employees. Stores up to 246 records, with up to five referral and placement positions and five client contacted companies. Up to 66 characters for employer benefits, 227 characters for employee duties. Prints reports, plus two mailing labels. 3-Disk General Ledger 26-4601 $499.00 A General Ledger system that holds up to 500 accounts and 5000 year-to-date detail entnes. An easily maintainable control files allows you to use multiple profit centers. Reports include: Chart of Accounts, Financial Statements, Transmittale Letters, General Journal Transaction Register, General Ledger Trial Balance for any specified period. General Ledger Work Sheet, General Ledger Source Cross Reference (shows entries for each source), Income Statement, Balance Sheet, Supporting Schedules, Statements of Cash Flow, Changes in Financial Position and Changes in Components of Working Capital. Interfaces with 3-Disk Accounts Payable and Accounts Receivable. Requires 64K Model II and 132-column tractor-feed printer, and 2-drive Disk Expansion Unit. Programs are written in COBOL and source code is available at extra cost, after signing a special license agreement. Because of the operation of the ISAM file system, capabilities are approximate. Inventory Control System (ICS) 26-4602 $299.00 This efficient and easy-to-implement inventory management system has features that allow you to custom-design your own reports. The program posts receipts, prepares labels and gives you complete maintenance of the referenced files-add, delete, inquire/edit and list. Prints purchase orders by PO number and six major reports – Master List, Vendor List, Items with a Zero Reorder Point, Price List, Opern Purchase Orders and Cost Inventory. With 2-Disks it will handle up to 3000 inventory items – capacity is 6000 items with a 3-Disk Model II and up to 9000 items with a 4-Disk system. 3-Disk Payroll 26-4603 $599.00 A complete, time-saving payroll system that calculates and prlnts checks and provides distribution to multiple General Ledger accounts (interacts with 3-Disk General Ledger). The program gives you efficient handling of hourly and salaried employees and permlts seven pay frequencies. Provides a wide variety of special earnings and deductions categories and allows entry of manually prepared checks and adjustments. Lets you track vacation and sick pay and recall up to one year of detalled pay history. Tables for federal, state and local withholding taxes are easy to maintain. Prints federal, state and local withholding reports. W-2 forms, payroll worksheets, check register and more. Handles up to 200 employees per year. 3-Disk Accounts Receivable 26-4604 $499.00 An open item and/or balance forward Accounts Receivable system that stores up to 1500 accounts, 2500 transactions. Reports include: Salesman List, Customer File, Alphabetical Customer List, Sales Journal, Cash Receipts Journal, Accounts Receivable Aging, Finance Charge, Statements, and Commissions Due. Easy Salesman, Customer File maintenance. Allows interactive entry and editing of sales and credit/debit memos. Allows customer account inquiry. Automatically keeps track of commissions due by salesmen. Interfaces with 3-Disk General Ledger System. 3-Disk Accounts Payable 26-4605 $499.00 An accrual Accounts Payable system that holds up to 1000 vendors, 2000 open payable items, 2000 General Ledger distributions, and 1000 checks. Interfaces with 3-Disk General Ledger. Reports include: Vendor File, Alphabetical Vendor List, New Accounts Pauable Transaction Register, Accounts Payable Aging, Cash Requirements, Pre-Check Writing Accounts Payable Check Register, General Ledger Distribution, Vendor Analysis, Check Reconciliation, and Job Distribution. Order Entry/ICS 26-4607 $499.00 Allows both single-pass invoicing and two-pass open order entry wlth separate billing. Will run in conjunction with the 3-Disk Accounts Receivable (four disk drives required). Allows maintenance of the item file and prints a Numeric Item List and an Alphabetic Item List. Orders can be entered and edited on request. The program also provides entry and editing of Inventory receiving transactions and prints an Item Receivings Register. Allows selective billing of open orders and prints a Billing Edit List. Also prints Picking Tickets, Order Edit List, Price List, Item Stock Status Report, Purchasing Advice Report, Sales Analysis by item, by Product Category and by Item Sales Volume. Has full backorder retention and control, and prints back orders by Item and by customer. Maintains 1500 items. Sales Analysis 26-4608 $299.00 Gives you an effective way to examine and evaluate sales information for your company. Data is obtained from the customer file of the Accounts Receivable program or the item file of the Order Entry/ICS program. The program prints eight reports, each of which shows sales activity from a different perspective – by customer, by customer type, by customer sales volume, by salesman, by state, by item, by item category or by item sales volume Reports can show sales, percent of sales, cost of sales, profit and percent of profit. The figures are presented for both period-to-date and year-to-date. Precedent Legal Accounting System 26-4620 $795.00 An office management program designed specifically for anorneys glowing standards established by the ABA Legal Economics Section. It allows total integration of Time and Billing, General Ledger, and Cash Disbursements giving you immediate access to vital client-related accounting information concerning services rendered, fees, expenses, billable and nonbillable time, cash receipts, trust activity and much more. It can be used by a sole practitioner or firms with up to 50 timekeepers. You can choose from eight different billing formats containing varying degrees of detail. You can also obtain comprehensive management reports. Docket Control 26-4621 $249.00 Avoid missed deadlines and appointments. The program accepts entry of reminder dates which occur while a case is pending. These dates can be entered individually by you or automatically calculated from userdefined models. For example, the date of death (relative day 0) begins the probate process; a death certificate must be filed within one week (relative day 7) and the will must be submitted to the probate court within one month (relative day 30). You enter the date of death and all subsequent dates are calculated and retained automatically. Docket Control may be used alone or with The Precedent Legal Accounting System. FORTRAN 26-4701 $299.00 TRS-80 FORTRAN (FORmula TRANslator) is a universal, problem-oriented programming language designed to simplify the preparation and check-out of computer programs. It’s primirily for problems expressible in algebraic notation, and requires the programmer to define fully the characteristics of a problem in a series of precise statements. Radio Shack’s FORTRAN is based on the ANSI-66 language and features complete error documentation in compiler, and hex and octal addresses for compiler listing. The package includes four modules consisting of the Editor, Compiler, Linking Loader, and the FORTRAN subroutine library. The FORTRAN package is supplied on a single diskette with deluxe binder and these manuals: FORTRAN User’s Manual, FORTRAN-80 Reference Manual, LINK-80 Reference Manual, and the EDIT-80 User’s Manual, plus a sample program. Requires 64K Single Disk TRS-80 Model II. Editor/Assembler 26-4702 $199.00 The advanced programmer now can quickly write, edit, test, assemble, and execute programs written in Assembly Language. An utility program will provide a source listing, pius list to the printer or display any text file. Features include the use of either 8080 or Z-80 mnemonics, and constants can be specified in octal, hex, decimal, or binary. Five modules are included: Editor, Macro-Assembler, Linking Loader, Cross Reference Facilitya, nd FORTRAN Subroutine Library. Assembly Language programs and subroutiens are assembled, a relocatable object code is generated and stored on disk to be recalled later by the linking loader, loaded into memory and executed. The text editor allows extensive and sophisticated editing techniques. It’s both line-oriented and character-oriented. Commands are simple and straightforward, yet powerful enough to accomodate the most demanding user. The Editor/Assembler package is provided on a single program diskette in a deluxe binder with these manuals: TRS-80 Edltor/Assembler User’s Manual, EDIT-80 User’s Manual. MACRO-80 User’s Manual, LINK-80 Reference Manual, and the Z-80 Instruction Set, plus a sample program. Requires 64K Single Disk TRS-80 Model II. COBOL Development System 26-4703 $299.00 Model II COBOL (COmmon Business Oriented Language) is designed primarily for business applications. It gives you access to a high-level implementation of the ANSI-74 COBOL Standard for minicomputers. Features include a single-pass compiler which generates an object code that can be executed directly by the run-time package; multi keyed ISAM; full leel-2 I/O Commands; interactive DEBUG with address stop, single step, and variable display and CRT control with extended ACCEPT/DISPLAY commands for attractive screen formatiing. The program is supplied on a single diskette with deluxe binder, and includes User’s Guide, COBOL Language Manual, Run-Time and Print packages. Requires 64K Single Disk TRS-80 Model II. COBOL Run-Time Package 26-4704 $40.00 Run-Time Diskettes are available separately for those who intend to sell software developed on our compliers. You don’t need to buy them for your own use if you buy a compiler. Compiler BASIC 26-4705 $199.00 TRS-80 Model II Compiler BASIC lets you develop application programs which execute several times faster than an interperter, like our Model II BASIC. Features include: an interactive debugging mode, full error control, indexed file access with single key ISAM, 14-digit floating point decimal format, complete CRT control, and single-pass compiler that generates object programs for fast, efficient execution by the run-time porgram. If you’re developing programs to sell, compiled programs protect your code against modifications. Requires 64K Single Disk TRS-80 Model II. (NOTE: This BASIC is not directly compatible with Model II BASIC, and cannot be used to compile existing Model II programs). Compiler BASIC Run-Time Package 26-4706 $30.00 Run-Time Diskettes are available separately for those who intend to sell software developed on our compliers. You don’t need to buy them for your own use if you buy a compiler. COBOL Generator 26-4707 $995.00 Reduce your COBOL development time. The Radio Shack COBOL Generator allows a programmer to define a complete software package and then generates a COBOL Source Program automatically. 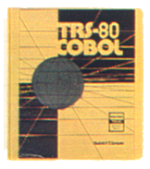 This Source Code can then be compiled using Radio Shack’s COBOL development system on the TRS-80 Model II. Without writing a single line of code, you have a software system up and running about as fast as you can visualize it. Using a dictionary facility, you supply information on files, data fields, validation rules and editing formats. Then define data entry screen formats, simple que screens and printed reports. An easy-to-use COBOL editor allows the modification of COBOL source code if you desire to add customized logic. Requires a 64K TRS-80 Model II with one additional disk drive and the COBOL Development System. Programmer-80 26-4708 $750.00 Radio Shack’s new Programmer-80 is like having your very own custom programmer. It’s designed to allow you to quickly and easily create an entire program or a complete series of programs to suit your particular needs. Utilizing a dictionary facility, the formatted screens lead you throught the entry of a few key facts about your application. Once you’ve provided the infomration, Radio Shack’s Programmer-80 automatically produces the program – along with the main menu – that will accomplish your task. It’s incredible! Now you can almost effortlessly create data entry or report programs (both simple and com ex). Radio Shack’s Programmer-80 is supplied on a single diskette with a deluxe binder and includes a user’s guide. Requires one additional disk drive. Available 10/30/82. Report Generator 26-4709 $299.00 Get printed reports fast! Radio Shack’s Report Generator utilizes a dictionary facility to determine the data file(s) you want to report on. The formatted entry screens allow you to easily describe exactly what you want to appear on your report. In addition to reporting data fields, you can include calculated fields, your own report tiHe and column headings, even provide totals. The new Report Generator program is supplied on a single diskette with a deluxe binder and user’s guide. Requires one additional disk drive. Available 10/30/82. Program Editor 26-4710 $79.00 Ideal for program editing, and can be used with any of our Model II languages. Editing commands allow you to easily delete, modify and insert characters or lines. “Global search” makes changes automatically throught program. Tabs are set automatically for the requirements of each language and line numbers are optional. The Program Editor package is provided on a single program diskette in a deluxe binder with User’s Manual. Requires 64K Single Disk TRS-80 Model II. This package can be used with any of our TRS-80 Model II languages. It consists of a powerful set of subcommands which simplifies programming. When you’re inputting long applications programs, the Program Editor is a fast and efficient way to debug your program and get it running quickly. Editing commands allow you to easily modify, delete and insert characters or lines. Global search locates selected text strings throughout the program and makes changes automatically. Line numbers are optional, and tabs are set automatically for the requirements of each language. The Program Editor is supplied on a single diskette wityh deluxe binder and User’s Manual. Requires 64K TRS-80 Model II. PASCAL MT+ 26-4711 $425.00 This language is a full implementation of the standard PASCAL as set forth by the International Standards Organization. PASCAL MT+ includes compiler, linker and the programming tools you need to help you build better programs faster. A speed programming package helps you remove “dumb” errors prior to compilation, with options including editor, reformatter, syntax check, variable check and fast compiler. Automatically readjust indentations and margins for structured overlay capabilities, chaining, call assembly routiens and supervisor calls. Assembly Language Development System 26-4712 $249.00 A powerful package for developing Assembly Language programs. The features of each module include: EDITOR-Global findkhan e, print on video or printer, execute most TRS-80 commands without exiting editor, and load single file or chain multiple files together. ASSEMBLER – IX and 1Y registers, separately-linkable multiple program sections, relocatable/absolute object, macros and sorted cross references list, enhanced mnemonic op codes, conditional assembly with optional assembly time prompting, and support of standard ZILOG Z-80 and undocumented mnemonics. LINKER – Indirect command file, optional module cross reference, entry point, and symbol listing. DEBUGGER – Find/examine/change memory by HEX or ASCII, copy memory to memory or fill memory with constant, two independent memories and one register dump on screen. Permanent/temporary breakpoints plus single step, and examine/modify by file or track/sector. FILE TRANSFER- Automatic multi-file transfers, converts files to target machine’s format, automatic SETCOM with default control file, transfers source, data, object and program files, automatic synchronization (either end responds first), and file names may be given directly, by “wild card” or by indirect command file. The Assembly Language Development System is supplied on a single diskette with deluxe binder and User’s Manual. Requires 64K TRS-80 Model II. Editor/Assembler, Series I 26-4713 $49.95 Lets you program in machine language for faster execution and more efficient memory use. Editor features automatic line numbering, line renumbering, single-letter commands, global search, plus the source text may be saved in disk files and source files may be loaded together in memory. Assembler features these options: “wait on error,” “no symbol table.” “list to printer” and “trial assembly”, plus single-letter commands, labels up to six characters, and eight pseudo-ops. The Editor/Assembler, Series I is supplied on a single diskette with deluxe binder and User’s Manuals. Requires 64K TRS-80 Model II. BASCOM BASIC Compiler 26-4725 $199.00 Designed to complement the Model II/12 Microsoft BASIC Interpreter, providing the programmer with an extremely powerful programming environment. MS-BASIC Compiler can support programs written for a wide variety of microcomputers with little or no modification. Allows you to create programs that execute faster and require less memory than the same interpreted programs, in addition to providing source code security. Speeds up applications and allows several chained programs to be supported by a main menu. Features BASRUN runtime module which contains most of the runtime environment. BASRUN allows you to develop a system of related programs that can all be run using the same runtime environment. CP/M Plus 26-4740 $249.00 This is a high-performance single-user, single-tasking operating system that opens the door to thousands of non-Radio Shack applications programs. Designed with the business user in mind, it is easy to learn and use. CP/M Plus features a flexible application program interface and powerful system utilities to facilitate software develownent. Compatible with CP/M 2.2 and IMP/M II files. hashed directory access, record buffering and multi-sector disk I/O support a high-performance file system. Hashing technique eliminates need for directory searching. Record buffers maintained in memory on an LRU scheme give the application program fast access to a working set of directory and data records. Allows two separate time and date stamps per file. CP/M Plus automaticaHy logs in a disk when it detects a media change, freeing the user from having to inform the system when a disk is changed. Disk space is dynamically allocated and released. GET and PUT utilities allow application programs to redirect serial device input/output to or from a disk file, with no program modifition required to use the utility. CP/M Plus utilities have a consistent syntax and accept optional English words to make commands easier to use and remember. The batch facility allows the user to perform repetitii tasks without re-keying the command sequence, and input files can include both program and system input. System primitives allow the application program to determine the amount of free space available on a drive, truncate files. and chain to another program. An additional primitive allows appliition programs to intercept and process system errors. Utilities allow customization of the operating system on a selective basis, and includes a symbolic instruction debugger, macro assembler, relocating macro assembler and linkage-gditor with overlay capability to simplify systems level programming. CBASIC 26-4742 $99.00 A commercial dialect of the BASIC language implemented as a compiler/interpreter. It requires the CP/M Plus operating system and is deisgned specifically to develop business applications. Compiles source code file into pseudocode instructions, so application programs use RAM more efficiently. Maintains real numbers in BCD format to assure that fractional parts of dollar amaunts will be exact and ledgers will balance to the penny. Also supports integer arithmetic, tremendously increasing program speed and throughput. Both fixed record length and stream input/output files are provided for maximum flexibility. Includes full complement of string functions, with strings dynamically allocated and unused memory returned to the system automatically. Supplied on diskette with complete documentation. COBOL Instruction 26-2706 $49.95 Teaches COBOL programming on a 64K Model II, or a Model 12 or Model 16 (in Model II mode). With self-teaching manual and diskette with hands-on exercises. Requires Radio Shack COBOL Development System to run hands-on exercises. COBOL Class Notes 26-2723 $9.95 For classroom or self-teaching. ReformaTTer 26-4714 $249.00 Now programs and data for use with IBM equipment can be prepared using the TRS-80 Model II. ReformaTTer handles the transfer of files between TRSDOS and IBM-compatible diskettes. It organizes data to conform to the 3741 single-density IBM format, performs an EBCDIC/ASCII character conversion, and automatically initializes diskettes to the IBM format, including all necessary fields, eliminating the need for specially pre-formatted diskettes. You have full control over all aspects of an IBM diskette with ReformaTTer. Creation/expiration date, record length, beginning of extent, end of extent, write protect, accessibility, and bypass and verify fields can all be modified. Also, any “data set” label can have its contents altered, the data set can be renamed, and even deleted data sets can be reactivated. ReformaTTer allows you to examine and alter existing data on an IBM diskette directly without transferring the data to a TRSDOS diskette-so you save time and money. And the convenient menu presentation and descriptive prompting messages make it easy to learn and use. The ReforrnaTTer program is supplied on a single diskette with deluxe binder and User’s Manual. Requires 64K TRS-80 Model II with two or more disk drives. Binary Synchronous Communications 3270 26-4715 $995.00 This program lets your TRS-80 Model II emulate an IBM 3270/3271/3275/3277 display station. The Model II can communicate through a modem and telephone line to a remote computer, using standard IBM Binary Synchronous Communications (BSC) protocol for the IBM 3271 or 3275. Such remote computers include IBM Systems 360/370 and 30-series Central Processing Units, plus non-IBM devices equipped with BSC-3270 communications capability. All functions of an IBM 3270 display station are provided for, including screen formatting, polling responses, data link control, time out control, and cyclic redundancy checking. A TRS-80 Model II equipped with the bisync-3270 program ma be used interactively with systems such as IBM’s TSO, CICS, VM/CMS, and IMS, plus with other remote systems that support IBM 3271 or 3275 terminals. Bisync 3270 communicates in half-duplex mode and may operate at data rates up to 19,200-baud depending on the type of communications connection used. It requires a 64K TRS-80 Model II, modification of the “A” serial port (extra charge), and the Editor/Assembler for mode reconfiguration. IBM/DEC Compatible Binary Synchronous Communications 3780 26-4716 $996.00 With this communications program, your TRS-80 Model II can function as an IBM-compatible remote terminal or a Remote Job Entry (RJE) terminal connected to a mainframe computer by telephone. Bisync-3780 allows the selection of IBM 2770, 2780,3741, or 3780 terminal protocols for communicating with the IBM Systems 360/370 and 30-series computers, IBM 2780 and 3780 terminals, DEC PDP-11 or VAX-11 computers, and other devices equipped with bisynchronous communications ability. Commands and options are provided which permit you to: send one or a series of files to a remote, receive data from the remote onto a printer or disk files, automatically convert between EBCDIC and ASCII codes, transmit or receive character coded data in transparent or non-transparent modes, automatically pad or truncate records to match transmitted data to required protocol, and decode printer forms control commands. Bisync-3780 communicates in half-duplex mode and may operate at data rates up to 19,200-baud depending on the type of communications connection used. It requires a 64K TRS-80 Model II, modification of the “A” serial port (extra charge), and the Editor/Assembler for mode reconfiguration. Binary Synchronous Communications 3270 26-4730 $1495.00 Allows your TRS-80 micro to emulate an IBM 3270/3271/3275/3277 display station. Communicate to a remote computer using standard IBM Binary Synchronous protocol for the IBM Systems 360/370 and 30-Series Central Processing Units, plus non-IBM devices equipped with BSC-3270 communications capability. All functions of an IBM 3270 display station are provided, including screen formatting, data link control, time-out control and cyclical redundancy checking. New features include separatety addressable printer support, 3274/3276 support, menu driven configuration and send file support. Requires modification of the “A” serial port (extra charge). The new TRS-XENIX development system – with the powerful C language – is for advanced programmers developing multi-user software to run under our new Model 16 XENIX, a true Bell UNIX operating system. C is a general-purpose rogramming language originally developedd for UNIX. Yet because of C’s flexibility, it has been used by software developers to write operating systems and utility programs for a number of computers. It has also been used to develop applications software for research and business uses, including numerical, text processing and data base programs. TRS-XENIX development system is for program development only and is not needed to run applications or other languages. It requires a minimum of 256K memory (512K is recommended) and a hard disk drive. Just happened on this site and this brings back memories. Back when I opened my accounting office I had a II with 3 disk bay with the 3 disc ledger, Multiplan and Scripsit plus Westlaw. At the time is another firm had a computer it was usually a PDP-11 or an IBM Systems 3. A few years later I went to law school and added a Model 100 with a disc drive and took notes, did papers and homework on it and then downloaded it to the II for final format and printing. The 100 was the 1st computer any student had ever brought on campus and it had to go to a committee to get permission to use it. On opening my law office, I upgraded to a 16 with 3 HDs and Xenix with their chain printer and 5 Wyse 100 terminals, one in each office. I added Precedent that was the first and for some years only true law office integrated system and Profile Plus plus converted the existing programs to Xenix versions. The system ran 24/7 for some years until long after RS stopped selling them and notified me they would not longer support repairs. I switched to SCO Xenix and a 80286 based server as it was supported by Precedent and West and though I could switch to other apps, these were key and core to the office. Scripsit was switched to Lyrix as RS never delivered the Scripsit for the 3000 Xenix that would have worked with the setup and discontinued Multiplan in favor of Visicalc so I went to SCO Professional. The 16 went to my desk and I used it as a standalone computer and also had it hooked to the office system. It continued to run with not downtime 24/7 until I retired. The 80286 during that time went through a HD so the 16 proved more reliable. As a result of Xenix and TRS-DOS I missed the MS/IBM DOS and 3.x days and my first experience was with Win95. In ’92 I bought a new mag with an operating system named Linux and scratched my head. Today, it is amazing to see how far is has come, the total loss of Xenix and the near loss of UNIX as well as the implosion of SCO and MS-Xenix and MS-UNIX. Today if I did not have to have specific apps requiring Windows, I’d be using Linux. From time to time I still think foundly about the II, 16 and 100 computers and just how great they were. Perfect, well noting is perfect but back then they were as close as you could get to a computer given the technology during their development. I could easily still use them for almost all of my computer work other than the tax apps I have to have. In fact Precedent is still as in spec as any law office program today out there unless you start considering hang ons such as Outlook. I have a TRS-80 Model II I would like to sell. Any ideas who might want to purchase it? I have about a half dozen 8 inch floppy discs I’d like to get the data from. I no longer have an 8inch floppy drive device. The discs were recorded in 1981 on a TRS-80. The floppies are Single Sided, Double Density (SS, DD) record length 128 bytes. I’d appreciate anyone’s input on how I might get these floppy disks read and the data transfered to CD. I have a copy of VISICALC which runs on my PC so I can access the files once they are readable on a hard disk. I started exploring computers as a kid in 1979 at Radio Shack. I had read a book that covered some aspects of BASIC programming, and I used to enjoy keying in programs and running them on the Radio Shack micros. The Model II seemed impressive to me because it looked more sophisticated than the Model I, and the text on the screen looked more clean and crisp, and I thought it was cool that it had mixed-case text because I had only seen a Model I without the lowercase mod. It’s amazing that back in the day, those expensive floppy and hard drives seemed like a lot of storage, but with 4 hard drives you could only get about 30 or 40 meg. There was no audio, images, or video, so about all you could do is have a huge mailing list or some sort of database. Just think… you could buy 4 hard disks for over $10,000 and store about 9 or 10 songs in MP3 format on them! hi, I want to buy a computer TRS-80 model II. I have a This TRS-80 Model II has 64k of memory and a disk expansion system with 2 additional disk drives. It is complete with manuals and system disks. This system works – boots up, etc. I have a TRS-80 model II for sale on Ebay for $3250. This computer was used for many years by an engineer in his home office. He designed HVAC systems, etc with the computer. I have all of his engineering program disks and many project files and would be glad to include them. He had it in use up until this year. Includes the DOS and Basic system disks, along with the Scripsit word processing disks. Includes the original owners manual for both the computer and the disk expansion system. Also includes have the manual for the Scriptsit word program. I have a TRS-80 model II with Daisy Wheel Printer. My fuse in the computer was damaged in a move. I wondered where I might get a replacement fuse. Can you give any advice? I am wanting to sell everything – however I will sell part. All of these were working 30+ years ago when we stopped using them. Please contact me directly at E_H_@yahoo.com I have photos of everything. If someone in Europe seeks a home for a Model 2, 16 or 6000, please send me a mail. Meanwhile, all the best for the new yer 2018.